Bed Leg Rest / Back Rest Inflatable Supportive Cushion. 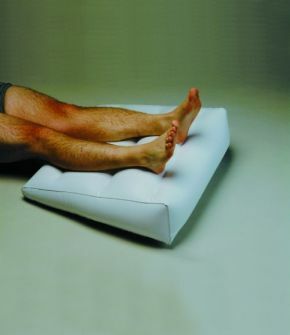 This inflatable leg rest or back rest cushion is designed to comfortably relax and elevate the user's legs. Being extremely versatile it can also be used as a back or head support or as a foot cushion. It is easily inflated and deflated with the pump supplied, making it fully portable. Bought it for my mother, first two nights have been the best for many years. The leg rest is very comfortable. Would give it 5 stars but didn\'t find the pump very useful. The connections kept coming off when trying to inflate it. I ended up trying to blow it up myself . Very happy with the leg rest once it was inflated. Brought it for my son who has water retention in his legs, it does a good job of resting his feet up comfortably. Bought for my 85 year old mother to go on her foot stool & she loves it. A well made product definitely recommend to all.